Deep voice: We apologize for any inconvenience. Tonight the role of Hamlet will be played by Othello, and the role of Othello will be played by Hamlet. Hamlet's Father's Ghost: Hamlet. My brother hath killed me. Iago: Dude, Desdemona is totally cheating on you. Othello(Hamlet): Really? I will have to ponder what to do about this. A lot. Cute but I definitely see your point. I like that it's hybrid Shakespeare and street slang. If this were Facebook, I would like this comment. I'm not sure what the protocol is here though. The circle is now complete. I have returned via your post on Facebook to find a new comment by you today. I appreciate the sentiment though. The Shakespearean street slang is something I enjoy too. If he were here now he'd write Street and Ebonics in iambic pentameter because he wants to mess with peoples' heads. And his films would be low level flicks that had easter eggs that would drive people nuts. 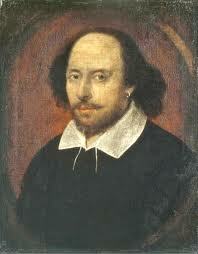 The story of Shakespeare in the modern world, not his plays in Street and Ebonics. Because I am not nearly clever enough for the latter.